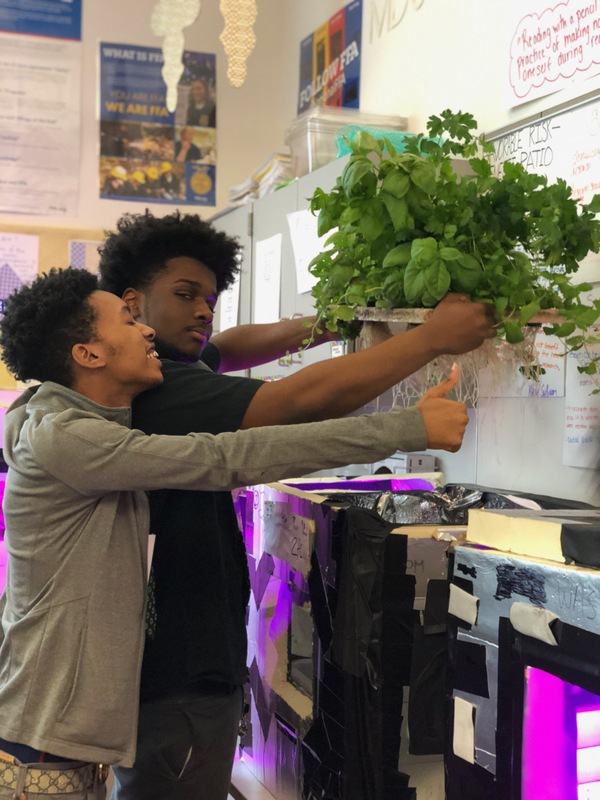 The seniors at Green Street Academy in Baltimore, Maryland have spent the past year building Food Computers, which are tabletop, hydroponic greenhouses that are climate-controlled with computer programming and robotics. In building these Food Computers, students learn how to apply technical skills in computer programming, engineering, urban agriculture, plant science, and design to immediate, real-world challenges such as food access and food deserts. At the end of each grow cycle, when the produce in our Food Computers is fully grown, students harvest the produce (in this picture students harvested a mixture of basil and cilantro), and cook with it! Throughout the year we’ll have a few food science and nutrition classes where students will get to experiment with making dishes to understand the impact of different cooking techniques, and then we’ll end the semester with an “Iron Chef”-style cooking competition where the students will have to make a dish that contains something that we’ve grown in a Food Computer. I took this photo after we had talked about how we can use herbs to flavor dishes and the difference between fresh and dried herbs in a dish. In this class, students compared pasta dishes with different types of herbs mixed into the sauce to taste the difference between basil, cilantro, sage, and mint.